I have been doing public outreach for science since I originally moved to Tennessee in 1996. It has been a fun ride, and I’m sure it will continue to be that way for many years to come. But two of the first things I learned when debating creationists and giving talks about the nature of science were: a) nastiness doesn’t get you anywhere; and b) just because you have reason and evidence on your side doesn’t mean you are going to carry the day. 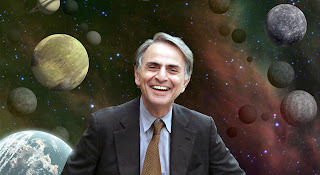 Hence, my sympathy for the mild mannered approach of Carl Sagan as evident in, say, The Demon Haunted World, or The Varieties of Scientific Experience, and my dislike of the more in-your-face take of those such as Dawkins, as fun as the latter may be for the in-crowd. Up until recently, however, I could only back up my preference with reasons of personal taste and anecdotal experience. Not any longer, now there is hard data. A recent paper in PLoS One by Jessica Tracy, Joshua Hart, and Jason Martens explored the reasons why people prefer Intelligent Design type “explanations” to science-based ones such as evolution by natural selection. The authors carried out a series of experiments using an established technique in experimental psychology, known as “priming.” Before exposing subjects to, say, a writing by Michael Behe or Richard Dawkins, the researchers asked them to imagine and write about either their own death or some dental pain. Subjects were then given a short passage authored either by Behe or by Dawkins — neither of which was explicitly addressing religion — and were asked what they thought. Subjects who were primed to imagine their death prior to reading the passages were inclined to like Behe better than Dawkins, and to accept ID accounts over evolutionary ones. The inference being that — as we all suspected — people are drawn to creationism out of emotional fears of personal annihilation, not by reasoned discourse. Here is the first kicker, however: when the researchers also gave subjects an additional reading, from Carl Sagan, the results were different. In the short passage, Sagan was explicitly arguing that scientific explanations of natural phenomena do not have to detract from meaning (yes, I know that Dawkins also writes about this, but much less forcefully and convincingly, I think). The Sagan piece had the effect of countering Behe’s, even among people who had been reminded of their own mortality. Pretty neat, heh? But there is more. An additional experiment was carried out by focusing on undergraduate and graduate students in the natural sciences, instead of the broader samples from the general population examined previously. Even after thinking about death, these subjects still favored biological explanations over Intelligent Design, and they even liked Dawkins better than Behe. It seems that education might trump people’s fear of mortality enough to make them understand that science is more sound than religion when it comes to explaining the natural world. The bottom line is that we now have some of the first experimental evidence that: a) coupling scientific accounts of the world with more philosophical reminders of where meaning in life comes from, and b) simply teaching science, are effective ways to alter people’s perception of the evolution-creation debate. Think about it: this means that an injection of philosophy and good science education actually makes a difference! Our efforts are not wasted, especially if we can remind ourselves of what should be obvious: people are attracted to pseudoscience not just because they don’t know enough science (though that is certainly the case), but because they find enhanced meaning in the mysterious. Paul Kurtz famously called it the transcendental temptation, and a strong temptation it is. The trick is to counter it with tools that cut deep enough into its emotional roots, not just addressing its surface appearance of rationalization.